Wheat Thins are a baked snack cracker made by Nabisco, owned by Kraft Foods. They are made with whole-grain whole wheat flour and come in a variety of flavors. Wheat thins may be eaten as a snack on their own, or with dips, cheese or toppings. When eaten in moderation, Wheat Thins may be included as part of a healthy diet. Carbohydrates, fat and protein are the three macronutrients that your body needs in considerable quantity. Original Wheat Thins offer 22 g of carbohydrates per serving. Carbohydrates are the body's main source of energy and should make up between 45 percent and 65 percent of daily calories, or between 225 g and 325 g daily based on a 2,000-calorie diet, says the Institute of Medicine. Wheat Thins contain 5 g of fat per serving, with only 1 g being the saturated variety. The American Heart Association recommends keeping saturated fat intake to less than 7 percent of total daily calories. If you eat 2,000 calories per day, this means you can safely consume about 15 g daily. Wheat Thins are not a significant source of protein with just 2 g per serving. Original Wheat Thins provides 2 percent of the recommended dietary allowance for calcium and 4 percent for iron. In addition, they provide 2 g of fiber per serving, as compared to the less than 1 g of fiber found in crackers made with enriched white flour. The crackers have no cholesterol. The ingredients list no high fructose corn syrup and trans fats, ingredients that the Center for Science in the Public Interest advises you to avoid. The first ingredient in Wheat Thins is whole-grain whole wheat flour, indicating that the crackers are mostly made of whole grains. The U.S. Department of Agriculture Food Guide Pyramid recommends consuming at least 3 oz., or 48 g, of whole grains daily, more if possible. Diets rich in whole grains may help to support a healthy weight and reduce your risk of developing heart disease. A serving of Original Wheat Thins provides 11 g of whole grains. Original Wheat Thins provide 230 mg of sodium per serving, and some of the flavored varieties contain up to 260 mg per serving. The Institute of Medicine recommends keeping sodium intake below 1,500 mg daily. If you are concerned about sodium intake, choose the Hint-of-Salt version of Wheat Thins, with just 60 mg of sodium per serving. 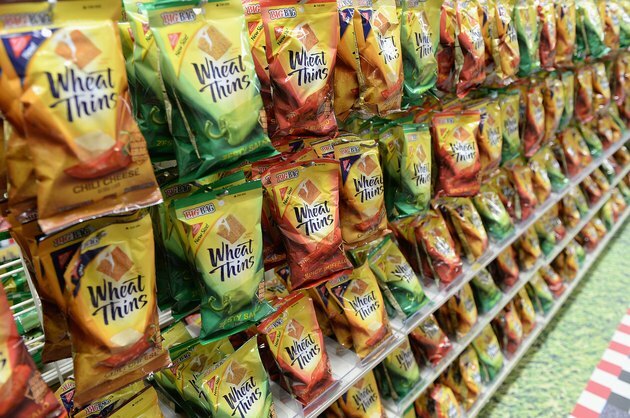 A serving of Wheat Thins varies from 11 to 16 crackers, depending on the flavor chosen. Consider portioning out one serving's worth of the crackers instead of eating right out of the box, which may cause you to eat two or three servings in one sitting. One serving of wheat thins has 140 calories, but eat two or three servings and take in upwards of 420 calories, which is a lot for one snack. Specific nutrition information for the crackers varies according to the flavor you choose – reduced fat versions, low-sodium versions and flavored varieties offer slightly different nutrient ratios. Do Multigrain Cheerios Help You Lose Weight?